Leadership and survival are one and the same. Without leadership you will not survive. He is one of a select group of sailors who have circumnavigated the world against prevailing winds and currents, a feat which until recently was considered impossible. He has faced hurricanes, collisions, flooding and the emergency medical evacuation of a crew-mate. Adam has also built a successful sailing school and trained future Round-theWorld racing crews from zero-experience to a state of ocean-going readiness. 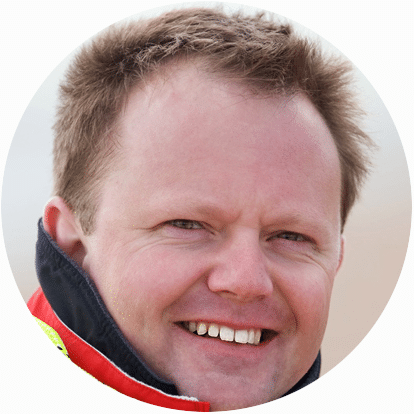 His energy and passion for sailing was formed as a child in small dinghies and ‘globalised’ through racing the BT Global Challenge, in 2000. As a graduate in Psychology and Philosophy and an accomplished sailor, Adam has unique insight into the practical applications of effective leadership and team development within the challenging environments of open-water and the corporate office. • Skipper of numerous offshore and ocean racing teams most recently a crew of 12 in the Fastnet 2013. I just wanted to thank Adam for supporting our event yesterday. Adam’s presentation was just what we needed to kick-start our new programme and very well-received.Please pass on our sincere thanks to Adam – he certainly gave us food for thought, very far removed from day to day life in Higher Education! Adam delivers a considered, focused presentation that challenges preconceptions on leadership and invites the audience to reflect upon their own styles and effectiveness in a compelling way. On the water, Adam creates a learning environment that helps teams develop collectively and to react as an effective group to overcome challenges that are very different from most people’s day-to-day experience. Adam was extremely insightful into his experiences at sea and utilised this against core competencies for everyday life. His experiences had the whole audience on the edge of their seat with his many stories of his near death experiences and how he managed to get out of them. He demonstrates how important teamwork, fun, leadership and communication are in all circumstances. I would definitely recommend him. Very professional an provided us all with a fantastic insight to how large corporations can make what seems small mistakes but by failing to take ownership and stand up to be heard can result in devastating consequences… the material was world class and Adam seamlessly connected it to the business we work in, which in turn helped everybody relate to the programme and understand key management traits. READY TO BOOK ADAM TUFFNELL FOR YOUR EVENT OR TO INSPIRE YOUR WORKFORCE? Simply use the booking form by clicking opposite.